“What good is the warmth of summer, without the cold of winter to give it sweetness.” It is quotes like this one from John Steinbeck that give meaning to this time of year for me, as so many of us are struggling to fix winter lawn damage. We are fully into winter here in my neck of the woods. The buzz of the holiday season has faded and my once lush, green lawn from last summer is now covered by over 2 feet of snow. Although the lawn is dormant, it is not fully protected from the damaging effects of winter. The recent succession of snow storms in my area remind me of the damage that snow can do to our lawns. 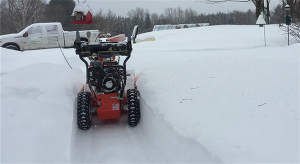 It is not necessarily the snow itself that causes the damage, but how we have to manage the snow that can cause our lawns to endure an higher level of wear and tear. A snowy, winter landscape limits our foot traffic to narrow paths. I have paths that weave through the layers of frozen snow to the compost bin, the chicken coop, and from the house to the mailbox. We also use our trusty snow blower to keep a nice clear path from the house to the bird feeders all winter. This allows me (and my cat Skipper perched on a table next to the window) to look out into the backyard each morning from a cozy room in our home and watch the Juncos, Cardinals, and flocks of Goldfinches swirl about at the well stocked feeders. There are even more paths that lead to destinations around the property such as the shed and the area where the trash and recycle bins are stored. All of these paths need shoveling or clearing with a snow blower to maintain access to important areas of our property. We continually use these travel paths so that we don’t have to endure any bodily harm caused from trudging through the snow or slipping on the “ice rink” that surrounds the house. The arctic temperatures that stuck around for almost two weeks turned the pretty snow to concrete. So here are the real problems the winter poses for our lawns: soil compaction and crown injury. The paths that are meandering across our lawn areas are getting a lot of concentrated foot traffic as well as mechanical compaction from the weight of our snowblower. These limited travel lanes are rough on the grass. Even though the fescue, bluegrass, and rye lie dormant over the winter, their crowns ,the very base of the grass plant, are alive and extremely susceptible to injury. Last summer’s grass blades and tillers (tillers are stems produced by grass plants) do not offer the same level of protection and cushioning around the crown in winter as they did during the flourishing growing season. Protecting the grass plants structure is important because new tillers grow from the crown in the spring. A healthy lawn depends on the grass plant’s ability to continuously produce new tillers. Less damage to the crown in winter means the plant will be stronger, healthier and have an easier time starting off in the spring. Considering we need these walking paths for our safety we will inevitably cause compaction to the soil and harm to the crowns of the grass over the winter. So, what you can we do about this inevitable effect of winter lawn abuse? Here are some things that you can do to counteract the toll winter takes on your lawn, particularly where people and pets are traveling most. In the spring apply a thin layer (1/4”) of high quality compost on all the pathways and heavily traveled areas. Make sure the compost was tested to ensure that the weed seeds and pathogens are killed off in the composting process. The compost will provide integral organic matter, a food source for the existing biology in your soil, as well as introduce new beneficial microbes which have a symbiotic relationship with your lawn grasses. The areas where you top dress your lawn will have a kick start and will green up quickly in the growing season. 2. Overseed worn areas as needed. You can overseed areas top dressed with compost by gently working some new grass seed into the compost. Be sure to keep the compost moist, it should have a dark brown color. If it turns light brown you’ll know it needs a quick soak down. I do not recommend aerating or mechanically disrupting the soil in these areas, or the rest of your lawn for that matter, with an aerator in the spring. The compost on its own has natural compaction relieving qualities via the biology and its processes, so let the compost do the work for you. 3. Put down a good organic fertilizer in the spring. I recommend starting off the season with an organic granular product. These fertilizers are usually made with plant-based ingredients and help to build organic matter in your soil as well as provide a short-term and long-term supply of nutrients for the turf system. Organic fertilizers also provide food sources for the microorganisms like humates, rock phosphate, alfalfa, kelp, fish, and/or feather meals, sulphate of potash, amino acids, and natural sugars like molasses. Follow the directions for application rates listed on the bag. These simple suggestions will nurture your over stressed lawn areas back to vibrant health, organically. Because the truth is, winter is pretty harsh on our lawns. And to make things worse, the way we have to cope with snow accumulation in the winter also forces us to be harsh on our lawns. It’s up to us to counteract this harshness with a bit of organic TLC and help our spring lawn on its way to making winter damage a distant memory. How are you coping with the snow this winter? Let me know on Facebook. Would you like help getting your lawn up to snuff after this tough winter? 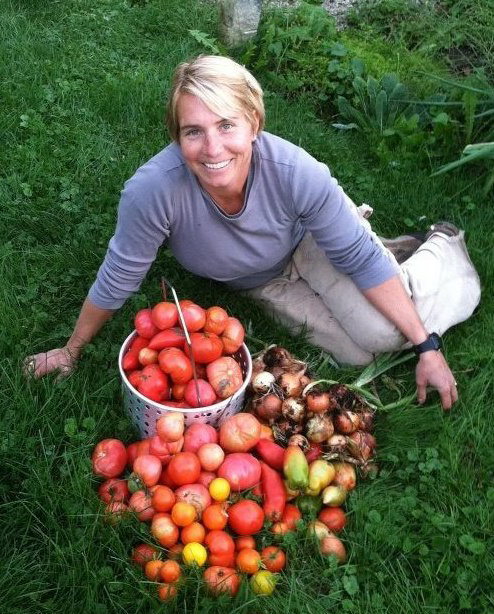 Complete Land Organics provides customized lawn care programs based on your lawn and soil system’s needs. Contact me for more information on the above topics or if you want coaching and guidance on how to care for and support a healthy organic lawn. 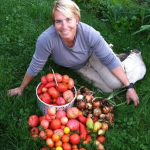 Britt Cooper Phillips, owner of Complete Land Organics LLC, is a Certified Organic Lawn and Land Care Professional who works with home owners, businesses, and organizations to build and maintain healthy and safe lawns, naturally.